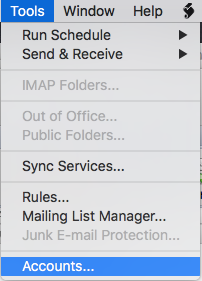 You can always use Workspace Webmail to send and receive email messages. But you also can view your email with an email client. Click the Tools menu, and then select Accounts. The next step will depend on whether you have an email account already set up in Outlook. In the E-mail Address field, enter your full email address. In the Password field, enter your email password. In the User name field, enter your full email address. Next to Type, select your server type. (You can find this info in your Workspace Email Setup Center). In the Incoming server field, enter your incoming server address. Note: Select Override default port to change the port. Select Use SSL to connect if you are using a port with SSL. In the Outgoing server field, enter smtpout.secureserver.net. Note: Select Override default port to change the default port. Underneath the outgoing server settings, click More Options. From the Authentication menu, select User Name and Password. Enter your full email address, and password. Note: As a courtesy, we provide information about how to use certain third-party products, but we do not endorse or directly support third-party products and we are not responsible for the functions or reliability of such products. Outlook is a registered trademark of Microsoft Corporation in the United States and/or other countries. All rights reserved.